Another conquest in the revitalised Planet of the Apes series, ‘Dawn’ has further enhanced the reputation of its new director (Matt Reeves) and delivered on its promise to realise the potential of a truly sophisticated and intelligent blockbuster franchise that was displayed during Rise of the Planet of the Apes. It’s 11th August 2011. My 25th birthday and exactly one month after I first sat down to watch the 1968 science fiction masterpiece that is acclaimed director Franklin J. Schaffner’s Planet of the Apes and its four subsequent sequels. Enthralled by its epic story of ruling classes, forbidden zones, the devolution of mankind into speechless pets, time traveling hippies and Charlton Heston’s chest rug, I’m sat in the cinema eagerly awaiting the start of the latest sci-fi blockbuster, Rise of the Planet of the Apes. Regardless of my personal opinion on reboots, anything will be better than Tim Burton’s effort in 2001. Within 10 minutes, I have already fallen in love with this dazzling new re-imagination of the origin of the Monkey Planet and its founder, Caesar. Immediately after the credits have rolled, cleverly teasing what is to come in the as yet unnamed sequel, I breathe a sigh of relief and celebrate what has been a successful birthday treat. As hungry as I am for more, surely a blockbuster as unusually intellectually stimulating and exciting as Rise cannot be topped? After all, the second film in the original Apes series, Beneath the Planet of the Apes, was by far the weakest of the bunch. If history does indeed repeat itself, then lowering ones expectations seems like the most sensible approach. It’s now 16th July 2014. Obviously not my birthday, but once again I feel like I can already crack open a beer and toast another successful entry into a much beloved franchise having seen Dawn of the Planet of the Apes at Cineworld’s surprise secret screening yesterday evening. It has achieved what I daren’t have dreamt it could; a worthy successor to one of the best big-budget films of recent times. Phew! Deploying a multi-layered story of betrayal, family, home and tolerance, it once again draws you into its unlikely but bizarrely believable world through the meticulous undertaking that has gone into its conception and development. Mark Bomback, Rick Jaffa and Amanda Silver’s script begins by reminding us during the opening credits of the devastation caused by the outbreak of the ALZ-113 virus, as seen during the end credits of the previous film. A plague so devastating, it seemingly wiped out the human race. Shifting attention to the now ape infested (I mean, occupied) Muir Woods, California, over a decade later, we see the complex community formed by an older, wiser and greyer familiar looking chimp called Caesar. Juvenile chimps are being educated by orangutans in the laws of their society (ape shall not kill ape), the male chimps and gorillas are out hunting whilst the females stay at home. It’s a young and primitive society, but a functioning utopia for all ape kind. Aside from Caesar feeling a bit down about his old chum James Franco not being given a part in the latest flick, everything is now hunky dory in Monkey Town. That is until the unexpected arrival of a trigger-happy Carver (Kirk Acevedo) who aimlessly drifts into the their territory. Unaware of the genetic advancements that ape-kind have gone through whilst humankind has regressed, feeling threatened by their sudden appearance, he promptly shoots one of them. Thus begins a calamitous clash of cultures so disastrous that not even Take That covering Nirvana’s Smells Like Teen Spirit compares. 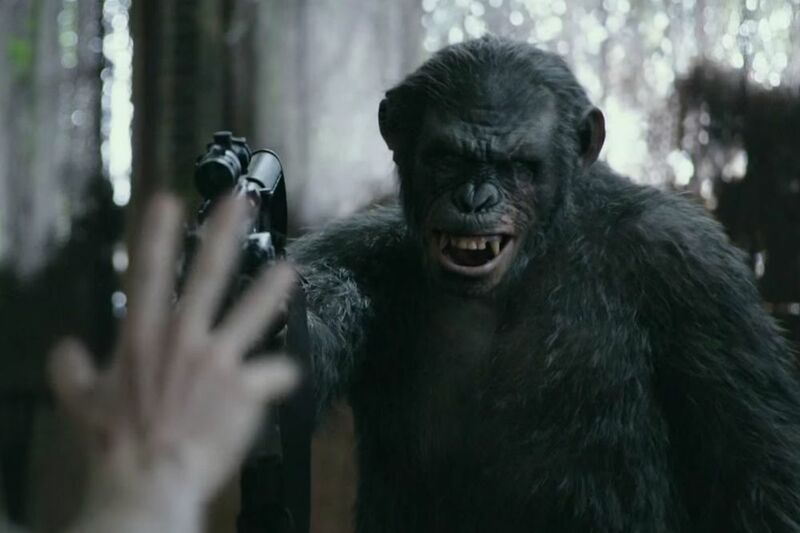 What sets the Apes films apart from other big-budget Hollywood blockbusters this year (Captain America: The Winter Soldier, Edge of Tomorrow, Godzilla, Transformers: Age of Extinction to name but a few) is not so much the spectacular way Reeves’ shoots his bombastic action sequences. Nor is it solely because of its gloriously uncompromising script that refuses to dumb down (monosyllabic apes aside) or spare the viewer any of the meatier dialogue that often can only take place via subtitles. Not even its consistently mind bogglingly life-like CGI that is on another level to almost everything that came before it can be the only reason why Dawn is so impressive. It’s a combination of all of the above. It hits a treble 20 with every single shot its spear-tipped poky sticks are aimed at. Well, almost all of its targets. The only real downside is how it struggles to pin down a genuinely sympathetic human character like Rise did with James Franco and his father, John Lithgow. Watching their relationship slip away due to dementia was heart-breaking, but more importantly, both actors were tremendous. Discounting Andy Serkis and his (once again) stunning ‘motion capture’ performance as the leader of the apes, struggling to contain a rebellious little git within his ranks who wants war with the humans at the same time as providing a future for his family, there’s nothing here that matches up to what we’ve seen previously. The closest moments this ever gets to that level are, at best, fleeting. Jason Clarke, whole-heartedly playing a father and partner determined not to let humanity lose its only chance to return to the glory days of old, gets the closest to immersing us in any individual humans struggles. We see what his old life meant to him in snippets, rather than in anything satisfyingly substantial. His friend in the human colony and co-leader of the people, Dreyfus, played by the ever-imposing screen presence that is Gary Oldman, gives a first impression of a man grappling with his responsibility to preserve a crumbling civilization. Unfortunately, one short emotional scene aside, it’s not expanded on or developed far enough to push the boundaries, but it is most definitely an assured performance nevertheless. I would have been shocked if it were anything less from an actor of his calibre. In context, this minor gripe is hardly detrimental to the overall quality of the film in the grand scheme of things. It manages to capture the essence of what makes the original Planet of the Apes films so much fun and clever, whilst continuing to expand on the mythology firmly established in 2011. Verging into b-movie territory occasionally with the explosive action sequences does it no harm whatsoever and only serves to recall the ambitious nature of those 1970’s classics. None more so than both Conquest of and Battle for the Planet of the Apes. Making apes riding horses seem terrifying rather than silly (honestly) is an admirable achievement. Quite frankly, whoever is writing / directing the next unnamed sequel (Night of the Planet of the Living Apes, anyone?) the foundations have been laid so sturdily by Rupert Wyatt initially and now Matt Reeves, that it will take some monumental effort to screw it up from here. Step up one Joel Schumacher? Nah. Please, no. No! It was a joke. Dawn of the Planet of the Apes is out in cinemas nationwide tomorrow (Thursday 17th July 2014). Owen borrowed all of his writing techniques from I, Partridge: We Need To Talk About Alan and can be found regularly mumbling away in a soft-brummie accent on the podcast, using profane words to describe films on Letterboxd, or wondering what to tweet about now the World Cup is over on Twitter. Good review Callum. Totally worth watching. Especially since it’s better than the first in many ways.